Place the chicken breasts into a 6-quart slow cooker and pour the sauce packet over them. Place the lid on and cook on low for about 4 hours. Once cooked through, use two forks to shred the meat in the slow cooker and mix well with the cooking liquid. To make the slaw, combine the garlic, oil, vinegar, brown sugar, soy sauce, and ground ginger in a small bowl. Toss with the broccoli slaw mix in a larger bowl. 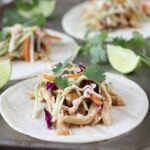 To assemble the tacos, place the shredded chicken on the tortillas and top with the slaw mix. You can also make a spicy sour cream sauce by combining some sour cream with a little sriracha to taste and drizzle it over the top. Garnish with a squeeze of lime and chopped cilantro.